Pro Tools | Slate Digital Virtual Tape Machines Available Now! 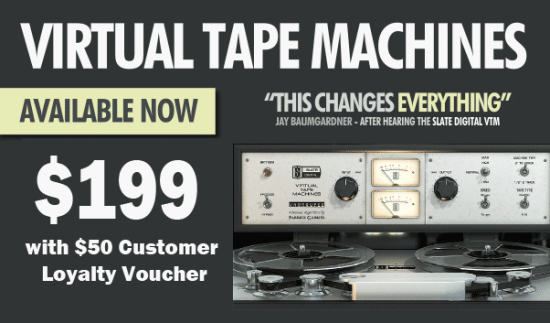 Slate Digital Virtual Tape Machines Available Now! Perhaps one of the most complex audio plugins ever coded, the Slate Digital VIRTUAL TAPE MACHINE replicates the sound of TWO industry standard tape decks including NRG RECORDING’s 16track 2inch machine and Howie Weinberg’s 2track 1/2” mastering deck. Using the VTM, your music will have added life, depth, punch, and dimension. The digital “high end” will be replaced by lush and smooth analog highs. Your low end will have more depth, punch, and harmonic ‘bigness’. Your mids will have added clarity and vibe. Demo the VTM now at www.slatedigital.com! Since we value our loyal customers, please redeem a non expiring $50 voucher here. Do you want to hear what the VTM can do? Check out our VTM AUDIO DEMO PAGE to hear A/B tests with the actual tape machines. 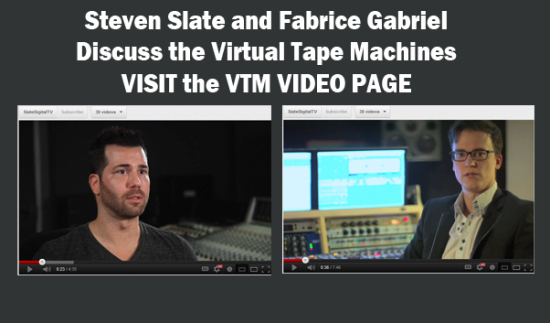 Watch VIDEO Interviews of Steven Slate and Fabrice Gabriel at the VTM Video Page. Steven discusses the making of the plugin, while Fabrice goes into technical detail and even shows various audio test tones processed with real tape, the VTM, and competing tape emulation plugins.